In many countries, beer mix drinks represent a major category for breweries. Growth is mainly driven by new products that provide novel interpretations and interesting taste experiences. 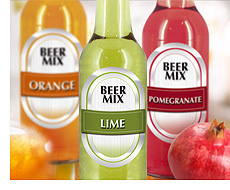 WILD has developed some creative concept innovations for this sector – for clear and for cloudy beer mixes – in reaction to a move from the long-term popularity of clear drinks to consumers’ growing preference for cloudy varieties with juice content and a natural image. Even classic shandies are gaining new nuances. There is also a rising demand for varieties based on wheat beer. Innovative flavors bring fresh impetus to the entire sector. The young target group, in particular, for beer mix drinks is experimental and appreciates a variety of different flavors. The WILD portfolio includes classic varieties and exotic fruits alongside the so-called super fruits.